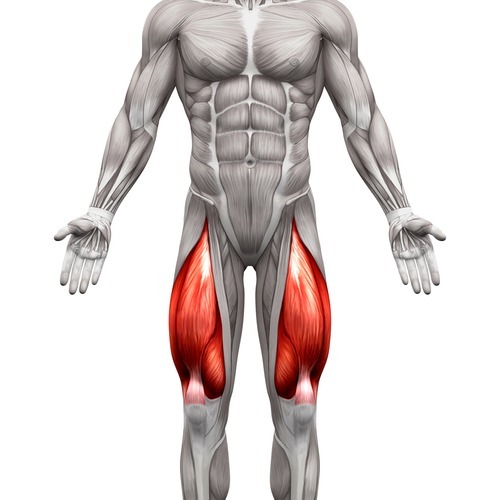 The quadriceps muscles group is one of the biggest and most powerful muscle groups in the entire body. No matter what your goal, be it size, strength or endurance, the quadriceps muscles are an extremely important group to target during exercise. Not only do well developed quads look good, they are functionally important as well. Strong quads are important in maintaining proper biomechanics in any activity, so it can help beginners do things like mild walking or jogging, and can also help athletes maximize the performance all the way to the professional level. Almost every lower body movement revolves around the quadriceps, so if you are experience knee joint pain like many people do, developing the quads can help better support the knee, reducing pain. What Exercises Best Help to Develop the Quadriceps? The first thing you want to do before you do any exercise is to first stretch your muscles, to reduce the chance of a tear, strain or other injury. Squats are not only a great exercise to develop the quadriceps, but it is a great combination exercise you should be doing anyway. Squats are great for strengthening the knees, the core and the lower back as well. Many people avoid squads because the squat rack and positioning of a typical squat can put you in a compromising position without a proper spot. If this is why you avoid squats, there are other variations of the traditional squat which can be just as effective. Other types of squats involve using dumbbells, putting your back up against the wall or other variations. The key to all of them is proper form and positioning. Keep all of that weight on the back of your foot, which is designed to carry the heaviest load. Use proper technique and don’t lean forward putting weight on the balls of your foot, this is not the load bearing part of your foot and too much weight may cause a fracture. Lunges are an exercise that anyone can do, and is another exercise that works virtually the whole lower body. Lunges are not only great for quadriceps development, but also for hamstring and secondary stabilizing muscle groups as well. It is important that you not only develop the quadriceps, but the other muscles around it as well. This helps to better support the knee, and keeping a balance between the quadriceps and the hamstring reduces the chance for injury especially in sports like basketball or football where you need to move quickly and change direction. Leg Press machines are arguably the best tools available when it comes to developing quadriceps size and strength. The leg press machine is done in a seated position at an angle, which takes all of that strain off of your lower back and core unlike the squat and lunge. These machines also take pressure off the secondary muscles which support these muscles as well, which allows you to lift more weight than you could doing standing exercises where other muscle groups are engaged. Leg presses are a relatively easy exercise to do, you want to start with your knees bent at about a 90 degree angle, and you want to extend your legs to the point where they are straight but also avoiding locking your knees. To complete one repetition, bring your legs back to the starting position of about 90 degrees. If you are looking for a more low impact exercise or one you can use for endurance, cycling, walking or jogging backwards can help develop the quads. Preferably you want to do this on a stationary treadmill especially if you are jogging considering you can’t see where you are going. If you choose to use this method, you should also perform the exercise regularly, meaning running forward on a treadmill or walking forward. Doing so will help you become more well rounded as far as your muscle development and maintenance are concerned. Sprints are an excellent choice if you are looking to develop big quads along with the explosiveness you get which can help you in sports. Sprints don’t only work the quadriceps but the entire leg, and provides cardiovascular benefits as well. Maintain an elevated heart rate through sprint training to get those healthy heart payoffs, shoot for about 80-90% of your maximum heart rate to do so.